Pag is one of the biggest Adriatic islands. Most of the island is somewhat barren and dry, while valleys are home to numerous vineyards and olive groves. The island is best known for its world famous Pag cheese as well as traditional Pag lace. It is connected to mainland via bridge on the side of the island that faces Zadar area. Pag has several ports which are accessible with ferries. Closest port on the mainland is the town Karlobag. 1. Hotel Pagus**** - In the city of Pag, on the island of the same name, is hotel Pagus. Hotel Pagus with its comfortable, air-conditioned rooms and its own beach, is ideal for pleasant family summer vacations. Restaurants here offer a rich assortment of gastronomic specialties, including famous cheese and lamb from the island, and its beautiful hand made lace. 2. Hotel Loža Novalja** - is located in the very center of Novalja, directly on the seafront. Its central position is ideal to explore Novalja, visit the beaches and numerous restaurants and bars Novalja has to offer during summer. 3. Hotel Luna Lun**** - Hotel Luna Pag was build in 2006/2007 and surrounded with Mediterranean vegetation only 20 m from the sea. Beach of the hotel is pebbled just 250 m from the hotel, and a rock beach is just 20 m away. Hotel Luna has 93 rooms (39 double rooms, 44 double rooms with help bed, 1 double room with 2 help beds, 4 family rooms, 3 apartments, 1 junior suite, 1 room for handicapped). Besides traditional tasty food, Pag is also an island of kilometers long beaches, crystal clear sea and wonderful bays. In summer, it's also known for its never ending parties and entertainment. Driving through Pag island roads is an amazing experience. It goes to show that many automobile manufacturers have used those very roads to create amazing commercials to promote the new car models. It is best known for its world famous cheese (Paški sir), delicious lamb and the famous lacework of Pag. Famous Pag cheese is made from milk of autochthon sheep that are still traditionally bred on the island. Other than tourism, salt production is a major economic activity that dates back to ancient times. Novalja - Novalja is the main tourist resort on the island of Pag. It is connected to the mainland by ferry port on the seafront and Pag bridge to the south. Novalja and its wider area are surrounded by beautiful natural sand or gravel beaches and crystal clear sea. The beaches are located near amazing hotels, numerous private apartments and resorts. Best known beach is Zrce that in summer becomes the center of nightlife in this part of Europe. We recommend a visit to the city museum in which you can see the underground aquaduct from ancient times that is now a major tourist attraction in Novalja. A great place to stay is youth hostel Zrće. Not far from Novalja is another attraction: Pag Triangle - triangular footprint in stone some associate with the appearance of UFO's. 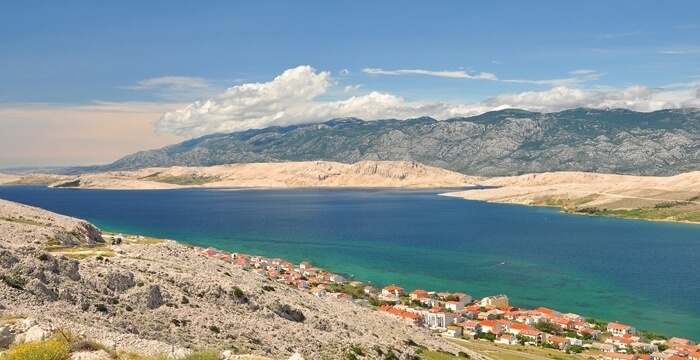 Pag - Pag, the largest town on the island is a place of rich history and cultural herritage. Construction of the new town started according to the designs of Juraj Dalmatinac in the 15th century. Most important monument is the Church of the Assumption located on the main towns square. The pride of town hotel-wise is definitely hotel Pagus****, and if you are more inclined to renting a private apartment make sure you check out No Name apartments in the area. We offer total 394 facilities.